Mercurelli's Garden Design: Seeds of Love 2014, here the Winners!!! Seeds of Love 2014, here the Winners!!! Moluccella laevis: 9, 42, 50, 102, 130 + 8, 22, 28, 59, 73, 75, 79, 102, 116. Lathyrus 'Singing The Blues': 4, 22, 49, 59, 75 + 9, 39, 42, 50, 79, 102. Borago officinalis f. alba: 30, 42, 73, 102, 116 + 4, 9, 79. Allium tuberosum: 8, 28, 39, 79, 102 + 4, 30. The first 5 numbers are the winners for each variety, which automatically get all the other seeds requested! Hello Noemi, Lovely to find your blog and twitter (I'm now following both) through your Pinterest follow of my boards! I've recently been to a Dixter study day about choosing & using seed and I have a feeling that you were there? I didn't know at the time and, if yes, am kicking myself as would have loved to chatted more! Je te remercie beaucoup Noémie, je suis heureuse d'être gagnante mais as-tu envoyé tes graines ??? Je ne les ai pas reçu ? Il a été une longue semaine de plans et de projets, et j'ai pu envoyer samedi juste à temps pour la date limite Isabelle. J'espère que les graines viennent bientôt. 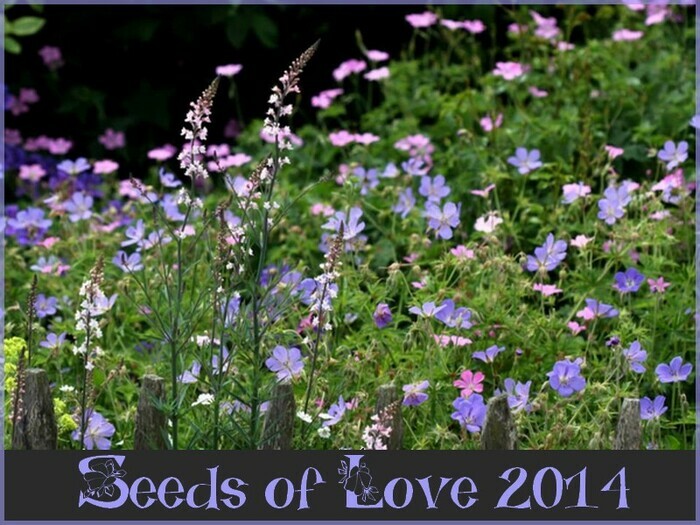 I take part to SEEDS OF LOVE 2014!! !